Dental implants or Bridgework, which is better? In my Delaware general dental office, I get this question all the time. Certainly every situation is different but I use the same format to inform the patient of the risks and benefits for all their options. Believe it or not this is an option that should be discussed. A patient needs to know what the risks and benefits are for leaving a space in their mouth. A space left will allow other teeth to inappropriately slide and twist out of position. This can cause gum and biting issues and not look good as well. The only positive about leaving a space is that there is time to decide on how to replace the tooth or teeth so you do not have to rush into a treatment. When you have a space between two teeth a fixed porcelain bridge can be an option. A bridge is when teeth on either side of a space are prepared to accept connected crowns that go over, or bridge, the space. The teeth on either side have to be evaluated for strength. A bridge is a tried and true procedure and occasionally may be more realistic then an implant. It can be done in a more timely fashion. It can take care of defective restorations or rotations on the teeth on either side of the space while taking care of the space itself. It is very predictable and approximate longevity for bridges can be given to patients. The risks are potential root canals on abutment teeth, recurrent decay on abutment roots and the need to perhaps prepare a virgin tooth. So at times this may work better than an implant or at times it may not be the optimum treatment. Most spaces can be filled with a removable denture. The primary advantages are reduced costs versus bridgework or implants, less invasive and reversibility. A partial can simply be taken out and a new procedure done if that partial is not adequate for the patients’ needs and desires. The primary disadvantage is that it is very stressful to the end teeth it hooks onto. Over the long term, it can loosen the teeth it is hooked too. It also is bulky and gets food particles underneath which may need to be cleaned during meals. If it loosens due to poor jaw bone anatomy then dental adhesive may also be needed. The advantages are that the teeth on either side do not need to be drilled. It is the closest procedure compared to a natural tooth. It is not always exactly the same tooth size but it can be extremely close. The disadvantage may be the additional procedure needed to obtain the bone to place an implant. The amount of bone is critical for successful implants. If there is insufficient bone then augmentation procedures may be required prior to treatment. This will increase the length of time and the cost of getting a tooth in the space. 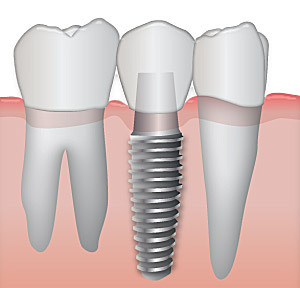 Overall, it is straight forward on the decisions to get an implant, bridge, partial or leave the space. However, the patient must understand all their options prior to making that decision and know the risks and benefits of each procedure and the likely outcome. Every situation has more than one solution and legally a dentist needs to discuss all your options. Some Dentists may talk as if you are familiar with our dental terms, if that occurs just ask him/her to explain in different terms that you understand better. If you do not fully understand the pros and cons for each treatment option ask your dentist to explain it again. Do not be passive, most Dentists will be happy to explain each procedure until you thoroughly understand the basic nature of it. If your dentist does not, it may be time to find another Dentist that more fully informs you of what they will be doing to you and why. Call my office today, 302-999-8113, for a no risk free dental consultation to address your specific dental needs.